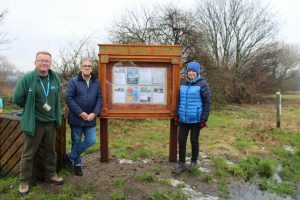 A community funding scheme run by Tesco in Litherland has enabled Rimrose Valley Friends to deliver four, hand-carved notice boards at entrances around the much-loved Country Park. The initiative required members of the public to vote for their favourite cause using counters given to them in store. Originally intended to improve just one entrance, the fund awarded stretched to notice boards being delivered to four entrances around the valley. Beach Road and Gorsey Lane are already in place, with two more due to be installed soon at the Derwent Road and Brindley Close entrances. Linda Gaskell of Rimrose Valley Friends added: “We’re delighted to be able to deliver the notice boards and to enhance several of the busiest entrances to the park. The notice boards will contain a mixture of charity, campaign and other community notices, aimed at helping to bring the various communities which surround Rimrose Valley closer together. “Work like this demonstrates that Rimrose Valley Friends as a charity is planning for the future of the Country Park and we are not put off by the threat of Highways England’s proposed road.